“Blue carbon” or coastal habitats may sequester significantly more carbon dioxide than forests. Coastal wetlands have long been recognized for their wildlife values, their vital role in water quality, and their significance in protecting our built environmental during storm events. Scientists, however, have recently begun to document another critically important value: their ability to absorb atmospheric carbon and help mitigate climate change. A recent assessment of all coastal habitats in Tampa Bay shows that marshes, mangroves and seagrasses can remove more than 3.8 million metric tons of carbon dioxide from the atmosphere over the next 100 years – equal to taking 7,981 passenger cars off the road every year until 2100. In addition to the protection of existing coastal habitats, restoration projects also played an important role in the assessment. Beyond their other benefits, habitats restored since 2006 will account for the storage of 240,000 metric tons of carbon dioxide which is the equivalent of removing the emissions of 45,800 vehicles by 2100. “Blue carbon” refers to the ability of tidal wetlands and seagrass habitats to store or release carbon and other greenhouse gases. According to the National Oceanic and Atmospheric Administration (NOAA), mangrove forests and coastal wetlands may be able to store up to five times more carbon than a tropical forest of equal size. Unlike forests, coastal wetlands store carbon mainly in soils (rather than in foliage or limbs). It can remain locked in soils for centuries or more. When these ecosystems are drained or degraded, the stored carbon can be rapidly released back into the atmosphere – sometimes releasing centuries worth of stored carbon in only a few decades. This report was a collaborative effort of Restore America’s Estuaries, Environmental Science Associates, Tampa Bay Estuary Program, Tampa Bay Watch, U.S. Geological Society, Woods Hole Oceanographic Institute, and the Florida Fish and Wildlife Institute. 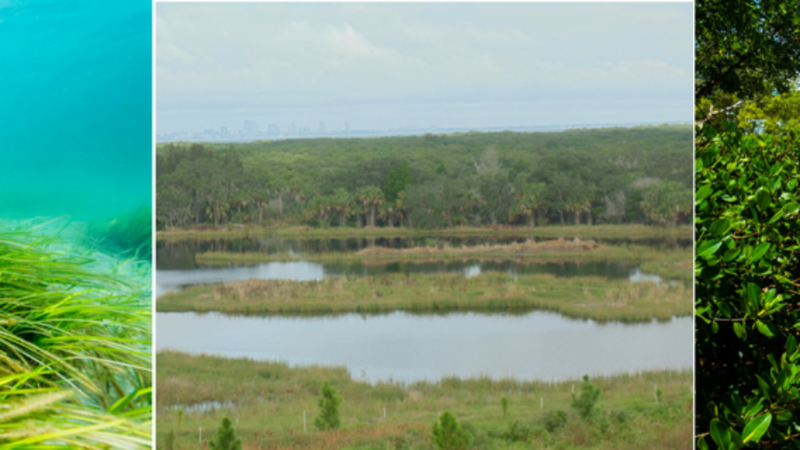 Funding was provided by the Tampa Bay Environmental Restoration Fund, NOAA’s Office of Habitat Conservation, U.S. Environmental Protection Agency, U.S. Fish and Wildlife Service – Coastal Program, and Scott’s Miracle-Gro.